The cestus gladiators were men who fought with their fists only, Roman boxing in essence if you want to categorise it. However this was not the end of the story, these fighters were named after the glove they wore, a cestus or a ceastus. This glove was also the same name as used in the ancient Greek art of pankration, and was similar to a modern boxing glove but could be much more deadly, often filled with metal or knuckle pieces or even spikes and blades attached to them. 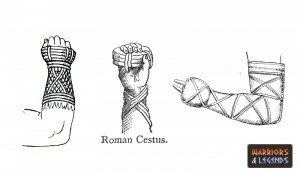 The word of these ancient gloves and gladiators comes from Latin as with many Roman terms, with caestus being derived from caedere which translated means ‘to strike’ the essence of the cestus gladiators. The cestus gladiator is another case where we don’t know for sure if these fighters were truly classed as gladiators or almost a completely separate class of entertainment in the amphitheatre. There are even mention of cestus gladiators fighting other weapon wielding gladiators, almost as an opportunity for them to prove that boxing was a suitable art form for close quarters combat. It’s even rumoured but not confirmed that the Cestus fighting was to much for even the Romans, with it being banned around 393 AD, but alas we have no real evidence to back this up. 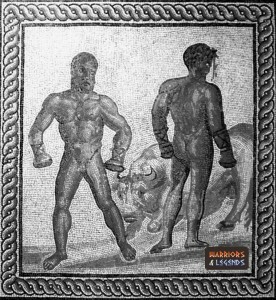 A pair of cestus gladiators, wearing the traditional cestus boxing gloves. It’s easy to say their only weapons were boxing gloves, but that is really cheating, so we will detail the various different types of cestus this gladiator used to wear. This was your typical Greek style boxing glove, with padding and or leather around the knuckles and wrists, typically to support the boxers hands rather than their opponents face, as it was common for hands to break with this kind of sport. Similar to the padded version but strips of iron were affixed within the padding, either blinded after the padding was applied, of mixed in with the padding. Either method would have had deadly consequence on anyone hit with it. Very little is known about these, and possibly more myth than reality, the spiked cestus gloves would likely have been custom made iron shapes to bond with the gladiators hand padding. Even more deadly than the standard iron cestus gloves. A selection of different cestus gloves, from the traditional padded, to iron wrapped, and even spiked cestus gloves. The cestus gladiators did not wear armour, doing so, would have been pointless in many cases, and only slowing them down when boxing. The only part that could be considered armour is the padding on their forearms, used to help when guarding their heads and body from punches. Of course in a boxing match the goal is to land punches on your foe, but for the cestus gladiators, this would really depend on what type of battle this was. In a fight with no blades or metal on the gloves the fighters would likely be more willing to trade blows, safe in the knowledge that their foe might not land a deadly blow straight away. With cestus battles using metal or spikes on the gloves, the fighting style would surely change. These battles would likely be more tentative, with each boxing careful to commit, knowing that one false move could lead them open to that one fight ending blow from their foe. The cestus gladiators were really a popular thing with the Greeks who were keen on boxing and would outfit their fighters with leather hand wraps, but typically to protect their hands. The Romans in typical entertaining style went all out with their dramatic improvements, starting with a circle of iron around the hands, making one punch deadly if landed. This was the start of the cestus gladiators were one blow could end the fight.